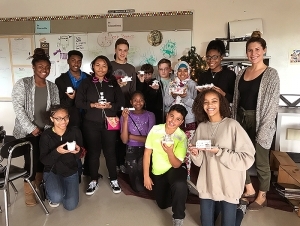 Ten Buffalo State interior design majors worked with Buffalo Public School (BPS) students to create architecture design projects inspired by poems, neighborhood revitalization, and resilience against natural disasters, among other things. The culminating projects can be seen at the sixth biennial Architecture + Education Exhibition at CEPA Gallery, 617 Main Street, in downtown Buffalo. It opens Friday, January 12, and runs through Friday, January 19. 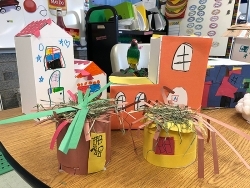 Approximately 250 preschool-through-high school students made projects ranging from drawings to 3D sculptures, with help from professional architects and Buffalo State, University at Buffalo, and Villa Maria College students. An opening reception at CEPA will be held January 12 from 5:00 to 7:00 p.m. It’s free and open to the public. “This is a great event celebrating a local culture of education, giving back, and design appreciation,” said architect Jessica Moore, lecturer of art and design, who taught Teaching Practicum for Interior Design in the fall. This was Moore’s first time teaching the three-credit course in which students are paired with professional architects and teachers. Participating schools this year were Buffalo Academy for Visual and Performing Arts, Bennett Park Montessori, Frederick Law Olmsted School, Leonardo da Vinci High School, and PS No. 53 Community School. Another group worked with first-graders charged with brainstorming improvements to their Jefferson Avenue neighborhood. They came up with ideas such as adding a drive-thru ice cream parlor and a pool.